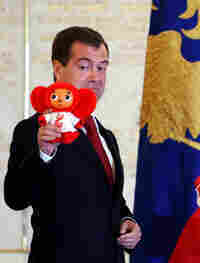 Well Wishes, Russian Style : Blog Of The Nation More unintentional hilarity -- courtesy of President Medvedev and a small stuffed mascot. In any case, here is Medvedev, attending a well-wishing ceremony for his country's Beijing-bound athletes, where -- apparently -- basketball player Andrei Kirilenko gave him the mascot that he's holding. Either he thinks the mouse (is that a mouse?) is booby trapped, or he doesn't approve of his country being represented by something so small and funny-looking. Gone are the days of the furry, stuffed hammer and/or sickle. Sigh.